About a week after my article was published, the advertisements on Bing were replaced with Mozilla’s own ads pointing to the correct site, but I still wasn’t satisfied that there was anything I could do. I added the URL to OpenDNS’s list and notified Mozilla about a problem I thought they would have been interested in. I’ve had practice taking down sites before that were infringing my copyright using DMCA claims but this kind of issue seemed more blatant, direct, and malicious. It annoyed me that there was nothing I could do. A few days ago, that annoyance took action in the form of a single ping. I was wondering if the site was still up. Unfortunately, it was. I received a response from the ping pointing me to an IP of 72.47.224.148. Out of curiosity, I did an NSLOOKUP to see what that IP address was registered to. It was going to a server on gridserver.com. That sounded oddly familiar. 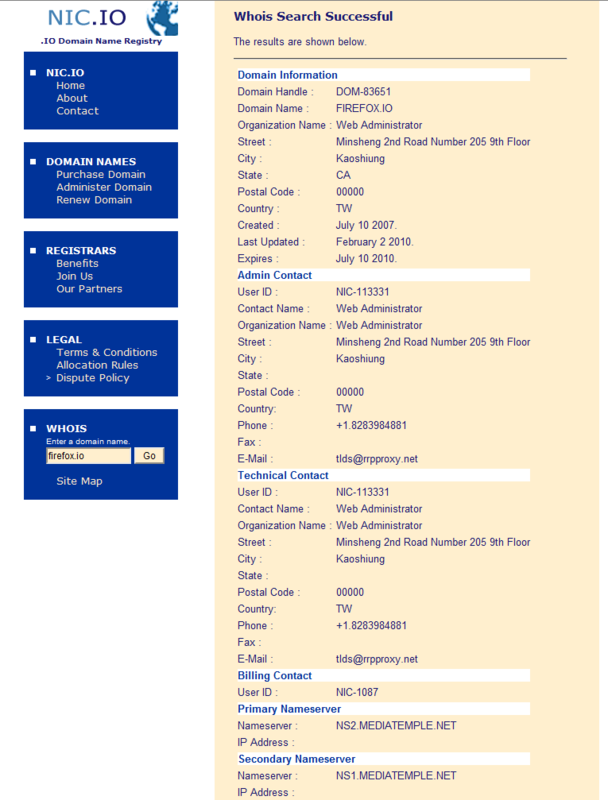 The only discernable information is that the URL points to a MediaTemple server. MediaTemple? MediaTemple! Gridserver.com also resolves to the MediaTemple webpage! Here I imagined that the site would be hosted on some random malicious server in China or Russia and it’s practically the server right next to the one my site is running on! And, until the person responsible finds a different host, it ends with a blank page and no more serving up malware-ridden Firefox. 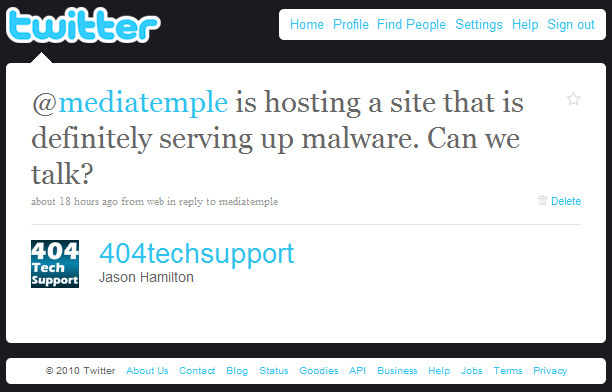 Props to MediaTemple for taking the content down. Though they’re likely to lose a customer, they’ve made the Internet a better place. Hopefully my efforts are also helping towards that goal. I know there are more malware-dealing sites out there, but let’s hope their days are numbered.